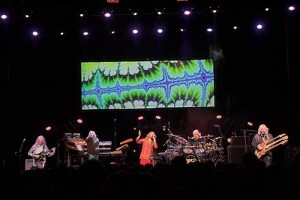 Popular and critically acclaimed maverick progressive rock band Yes continued their 2013-14 Three Album world tour presenting three complete iconic works: "Close To The Edge", "Going For The One" and "the Yes Album" live, with a lighting design by Don Weeks and with the latest European section featuring Robe’s ROBIN Pointe multi-purpose moving lights. 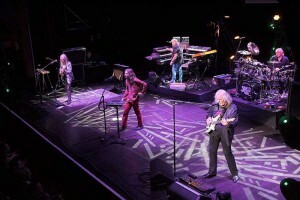 The starting point for the Three Album tour stage presentation was based on a concept first created in spring 2012, depicting a starker stage set-up than in the past with no scenic elements, just an upstage video screen. This put a huge emphasis on lighting. The 12 Pointes were rigged onto a double triangular scaffolding structure upstage and on two downstage side towers, left and right, and utilised for most of the effects lighting. At each venue he also hooked in to the house’s overhead lighting rigs. 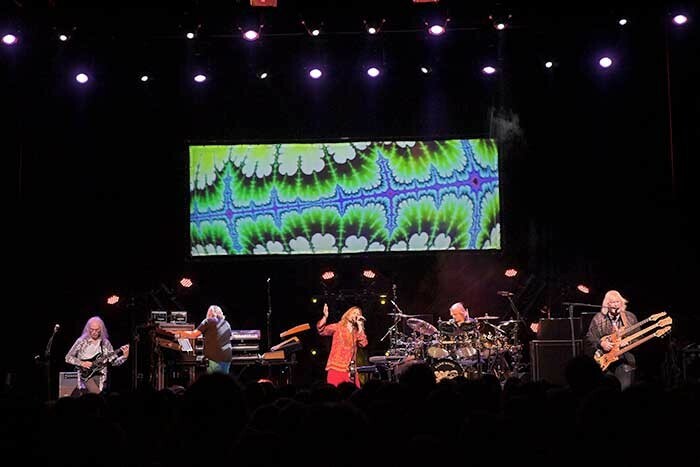 At some venues like the Ancienne Belgique in Brussels where Robe’s reporting team caught up with him to experience the show, the Pointes were an ideal match as the house lighting system also contains 20 Robe MMX Spots, which he maximised particularly for gobos and texturing. The Pointes were absolutely fundamental to Don’s carefully crafted show where each lighting cue is considered and relevant to the music, and he carefully layered the lighting to match the intensity and intricacy of the music. “It's really more about enhancing and adding to the mood and the vibe, emphasising a seamless relationship between visuals and music,” he explained. Don, based in Rochester, New York, began his professional lighting career in the 1980s, when moving lights were still at an embryonic stage in the geekosphere, and has been using Robe products for the past year. He first looked at the brand on the recommendation of Donny Lodico at VER and LD Scott Warner, initiator of Robe’s ROBIN Cyclone, when looking for an LED wash. At that stage he checked out the LEDWash 600, immediately liked it and started using it in his ongoing design for Yes. More recently he heard about the Pointe which was launched last year. He watched the product video and asked Robe USA to supply a fixture for him to test. "I am very impressed with the output, it does so much more than any of the other beam lights and I love the rotating gobos and prisms," he comments. Yes, one of the most influential and innovative bands of the ‘progressive’ genre with an amazing career spanning five decades are releasing a new studio album – their 21st – in the summer and a brand new tour starts shortly after.